Some of the tools required. Tools for building a safe, secure, livable cabin in the woods are still available, it just takes a little effort to find them. Given the extreme instability of our so-called "civilization" it may be necessary in the future to have such an alternative living space. More tools and information on the Shelter page - click here. And still more tools on the Tools - Restoration and Rebuilding page. And How to make sheathes to keep tools sharp. First, building materials must be obtained. In my part of the country that means logs - felling trees. 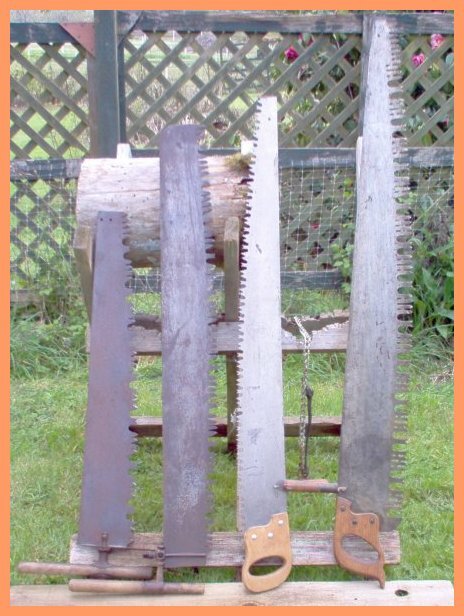 A selection of cross cut saws, from 3 feet long on the left to a 4 foot saw on the right. The 3 foot saw is good for cutting notches in logs and cutting firewood sections from up to 12" diameter logs, while the longer saws are better for felling and also bucking larger diameter logs. Single bit axe on the left is good for chopping off limbs, and safer for the inexperienced to use than the double bit falling axe on the right. And then the logs must be smoothed and shaped, and if there is time debarked. Debarking of old growth logs required a ''slick,'' a huge chisel about 2 feet long with a 4'' wide blade. Second growth logs usually encountered these days can be debarked with smaller - but still sturdy - 1 1/2'' or so chisels. Or large draw knives. 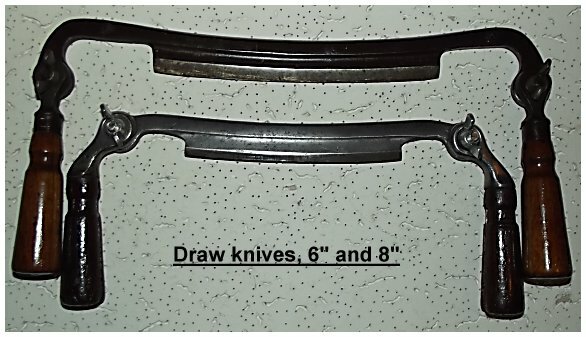 The draw knives shown are my smaller 6 and 8 inch folding handle draw knives. I use 10'' solid handle draw knives for bark removal and rough shaping. Shaping logs so they fit snugly together is done with hand saws, bow saws, broadaxes, framing hatchets and adze. Broadaxes are scarce and expensive so other tools are generally used now. The broadaxe shown below is at least 150 years old. Adze tools come in a variety of shape and sizes for cutting and shaping wood for a specific purpose. This lighter adze with an 18'' handle is used to smooth logs and boards so they fit together better, smoothing logs for use as window and door casings, plus a whole host of other cabin building work. A lighter adze is easier to swing but does lack the energy needed to hog off wood quickly. 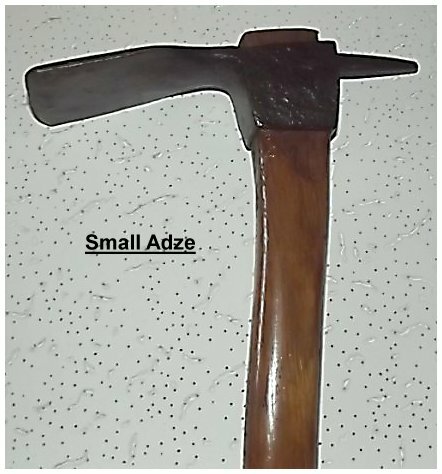 This adze is used to smooth a finish after the heavier adze above has removed most of the wood. 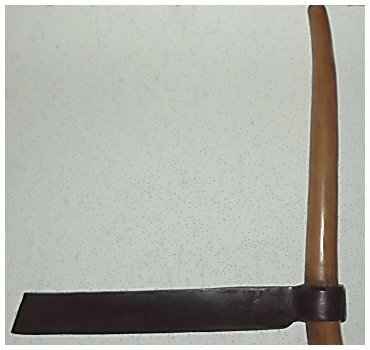 A bowl adze is used to cut a hollow in wood to make bowls, plates, rain gutters, etc. 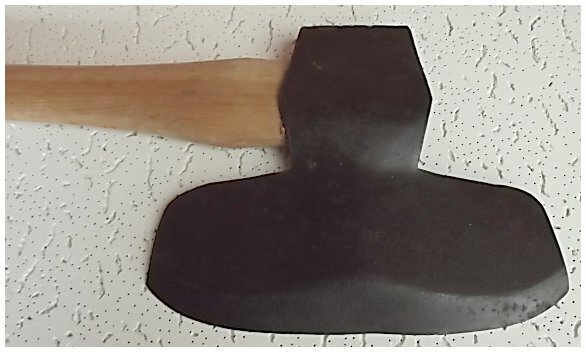 This is a small adze with a 1.6'' curve, a 14 5/8" handle, and the head weighs 14 ounces. 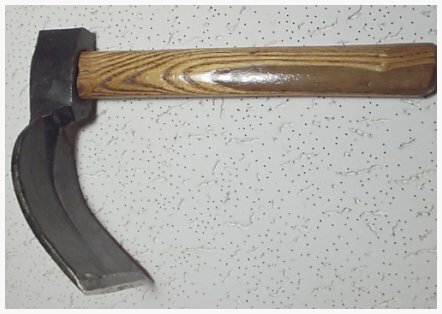 This adze is new, hand forged from high carbon steel by Ivan Stoev in Bulgaria. Mr. Stoev is a master 'smith and has many shapes and sizes of axes and adzes listed (Aug, 2015) on eBay under the store name thracian-pickers. 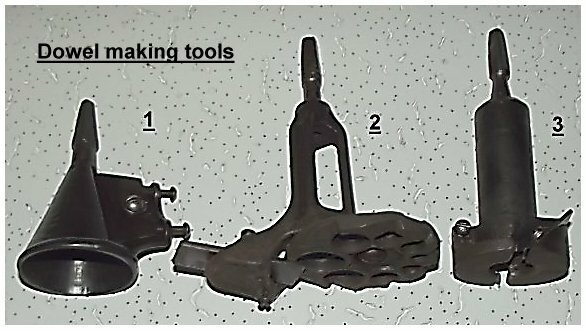 The tool shown at left is perhaps the perfect "Wildcrafters" hatchet for building smaller, expedient shelters. 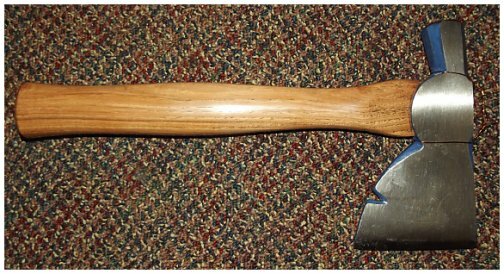 The bearded axe head has a 4 1/2'' edge, the cooper's adze on the other side has a 1.6'' concave edge can cut bowls, gutters, notch small logs, etc. The handle is 18 3/4'' long and the total weight is 1 lb 12 oz. This Wildcrafters hatchet is hand forged by Ivan Stoev in Bulgaria. It cost less than $60, including very fast delivery, in July 2015. The eBay store name is thracian-pickers. 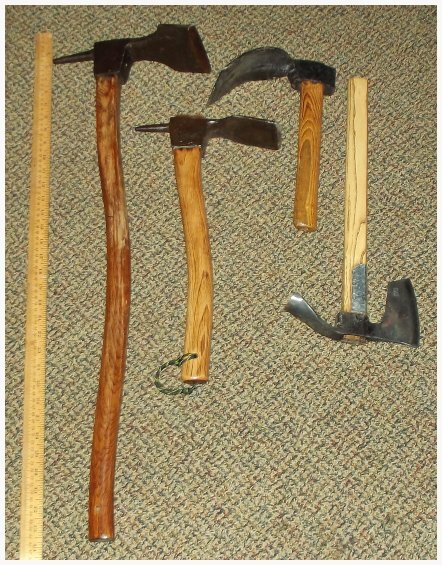 The adze lineup above needs perspective to see the relative sizes of the various tools. 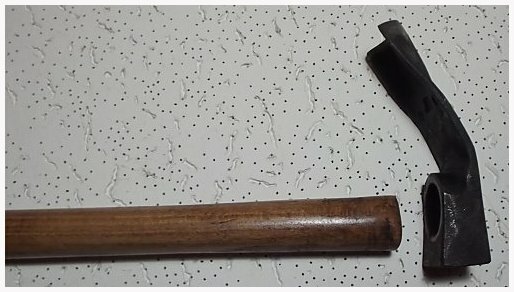 On the left is a traditional large adze with a 33'' handle and 4 1/2'' face. The primary use was making logs into planks. These are dangerous tools and must be used with care! Hit a knot and the blade can slide off and cut right into an ankle. Been there, done that. When I was building a cabin 45 years ago I gave myself a nasty cut on my left ankle. 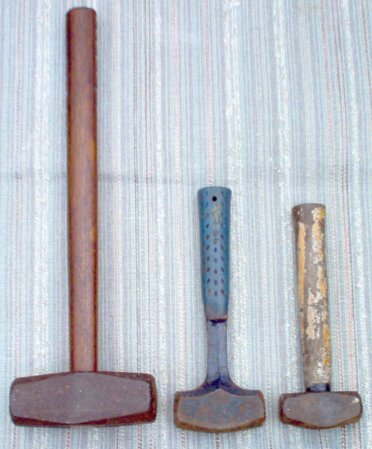 The shorter adze 2nd from left was commonly used in ship building, the point on the head being used for packing caulking between boards. This is an excellent tool for beginners to use for rough shaping of logs on the interior of cabins. 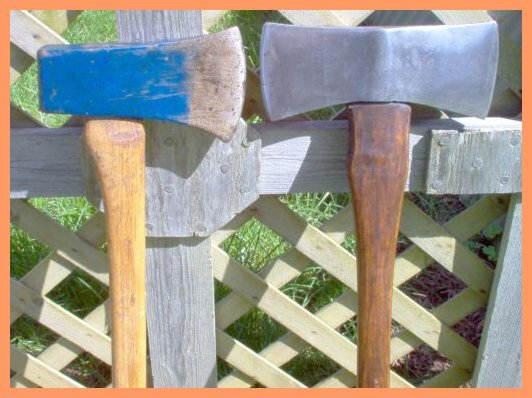 The heavy, short handled adze 3rd from left is used for hogging out wood for making door and window sills, flattening the ends of floor joists, etc. I skipped right over the foundation. Shovels and picks are utilized for that hard work. 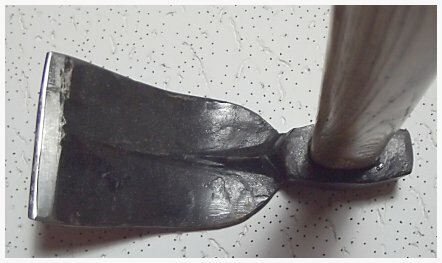 Above, a heavy hand-forged pick made for the Italian army, most probably for WW I. It was a little rough from years of use so I sanded it down with a hand-held belt sander. In the photos above the handle has been refinished but the head is not yet finished. This pick was properly forged with soft iron for the main body and socket. The pick point is hardened steel and the back and edge of the blade is hardened steel - a beautiful, time honored way to forge tools. This large, well-made pick was purchased in July, 2015 from Sportsmansguide.com for less than $15.00. Fastening logs together or timber framing is down with dowels put into drilled holes. The auger bit above, bottom, is 26" long. 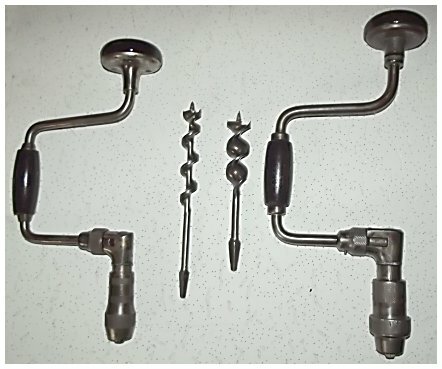 Five types of auger handles. #1 is a single purpose handle, hand made in the late 1800's, for the lowest auger on the right, above. #4 is a James Swann handle, perhaps the strongest one of all. 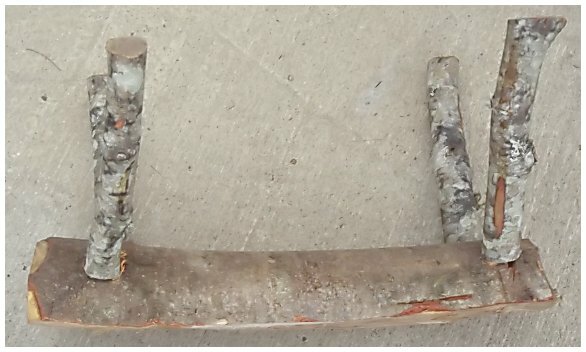 #5 is a ratchet auger handle that is very strong - it weighs almost 4 pounds! - and the left handle can be removed and screwed into the top for boring holes in corners or tight places. Note that the top of the handle has a swivel joint and will not tear out the palm of a hand in use. The small augers at top are 11/16" and 5/8" in diameter. These are used for boring holes in logs to secure them together with rebar. The larger augers are for the use of thick, strong dowels to secure logs together or to the bottom foundation logs. The small augers are 18" long - long enough for securing two logs together with iron rod or rebar so they will not slip. These are used for logs cut out for window and door frames, for example. The standard brace and auger bits can be used for drilling shallow holes. These are used for window and door casings, planking, and making furniture using dowels made with the tools shown below. Note that the auger bit on the left is a single-flute design for cutting soft wood that produces large chips when drilling. The auger bit on the right is a double-flute design for cutting hardwoods; the double-flute is stronger yet can handle the smaller chips generated when drilling hardwood. 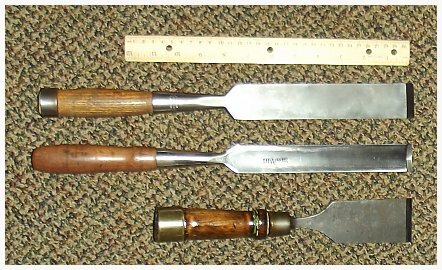 Smaller draw knives are used to shape logs, remove bark when thin, and when needed to taper the end of poles and wood to be made into dowels. Folding handle draw knives are especially handy as when the handles are folded in they protect the cutting edge of the blade. And they can be safely and easily carried (see here). Spokeshaves are used to roughly shape a piece of hardwood so it can be finished into a dowel. 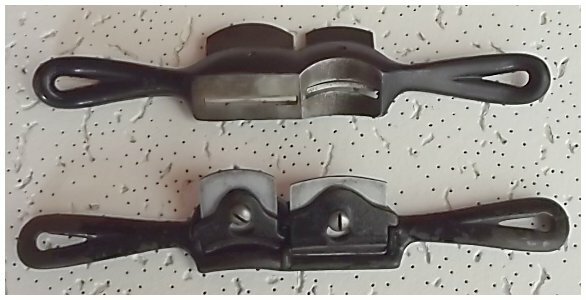 The spokeshaves shown at left have dual cutters, one cutter being concave to produce smoother round cuts. #1 is a dowel pointer. It tapers the end of a piece of wood so it can enter the dowel maker. #2 is a dowel maker, adjustable from 1/4" to 1", and can cut dowels up to 4" long. #3 is for cutting a flat face on wood at the end of a 7/8" or 1" dowel for making legs for benches, tables, etc. 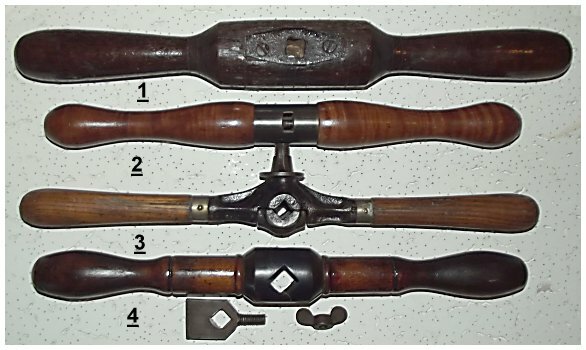 These old tools can often be found in good condition on eBay. Then the dowels are driven into the holes. 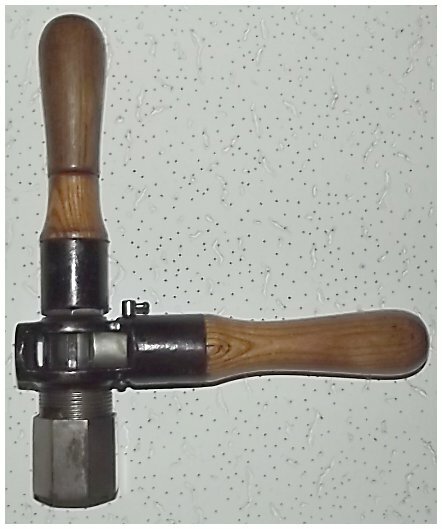 "Single jacks" are heavy one-handed hammers. Right to left: 2 1/2 lb, 3 lb, and an 8 pounder. The 8 pound is tough to use one handed (it can be done), but the handle is long enough for two handed use when needed. The most useful single jack for driving dowels is the 2 1/2 pounder on the right. A froe is for making cedar shakes from "bolts" of cedar or other wood that splits straight. The shakes can then be used for roofing. This froe blade is 18" long and was made in the early 1930's from a truck leaf spring by a blacksmith in Langlois, OR, in the early 1930's. The shakes were drilled and wired in place. 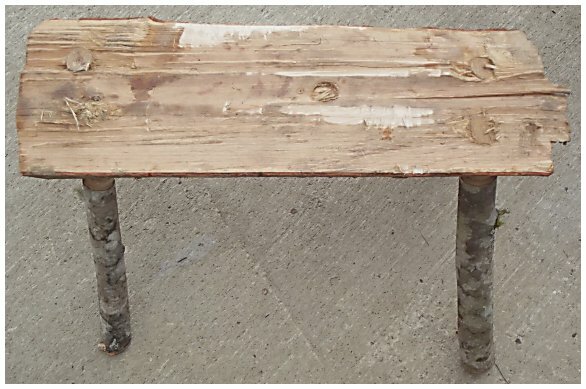 The bench below was made in a half hour. It is crude but it works. With more time the legs could have been made from dowels and the seat made nice and smooth, even slightly concave to feel better when sitting down. How to make sheathes to keep tools sharp.